Our beautifully decorated, three-bedroom, three-bath, two-story villa in Sandestin's Northshore neighborhood is a on lake overlooking the 15th green with views of the Choctawachee Bay. e have just completed a major update to the villa, include new bathrooms, new paint, new carpeting, and new furniture that turned out amazingly well. Enjoy spectacular surroundings plus all the comforts of home including a fully stocked kithen, screened-porch, gas grill, Wi-Fi network with highspeed internet, upstairs balcony with view of bay, great quiet areas to walk and play, and easy access to the Beach, Marina, and Village. 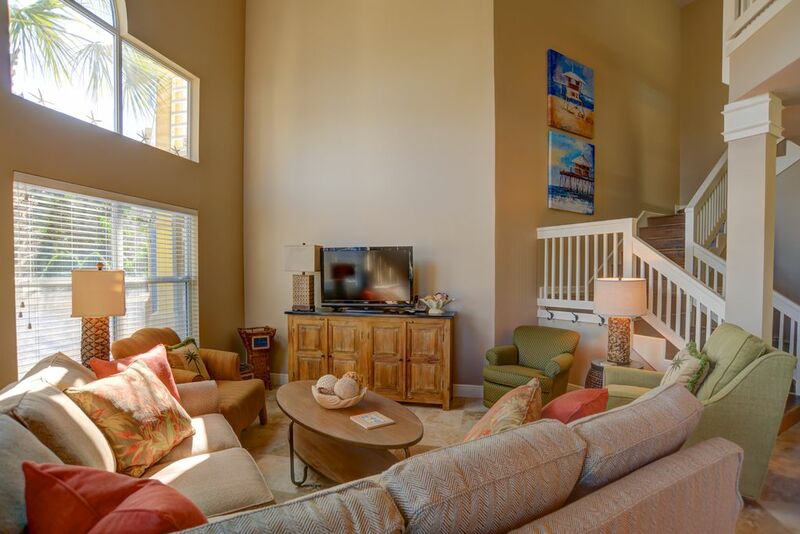 Several guests have commented that this is one of the nicest beach townhomes they have stayed in. Sandestin Resort is the premier resort on Florida's Emerald Coast. Enjoy the challenge of four, distinctly different, championship, golf courses and the serenity of the #1 beach in the USA according to USA Today Online. Located in Sandestin's North Shore neighborhood on a lake overlooking The Links Course 15th green with views of the Choctawhatchee Bay. Beautiful views and very quiet. Enjoy the palm trees and sun sets over the bay. Convenient to the Beach, Village at Baytowne Wharf, great restaurants, shopping, and one mile from the Silver Sands the nation's largest designer outlet mall.